It was a cold and wintry afternoon in Adelaide today. What better time to visit an old lunatic asylum? 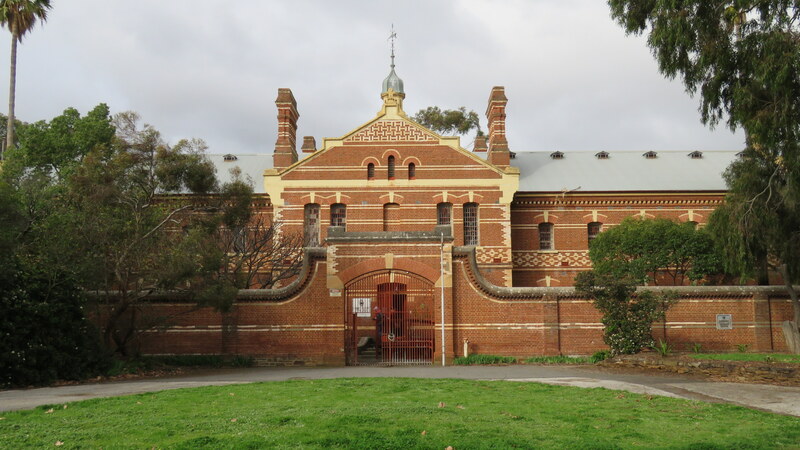 For nearly 90 years, Z Ward was home to the ‘criminally insane’ patients of South Australia’s health system. Opened in the late 1880s, it was at the rear of the Parkside Lunatic Asylum complex, and was built to house the state’s criminal and refractory patients. The approach to Z Ward. It is now open occasionally for visitors, and you can see from the pictures below that the inside is largely intact. It’s very plain and looks like a prison. Not that I’ve been to prison. But I did watch Porridge in the seventies. Ground floor hall, with open cell doors. First floor hall, with open cell doors. And why is it called Z Ward? I’m glad you asked. Originally it was called L Ward, but when telephones started being used, people phoning up heard it as Hell Ward. Not really a comfort for anybody. So it was renamed Z Ward, because by adding a straight line to an L you make a Z, which was easier for re-marking all the ward’s laundry! Outside, there is a Ha Ha Wall, designed to give the illusion of a low wall surrounding the building. On the patients’ side, however, a deep ditch makes it too high to climb over. The ditch is now overgrown with small trees, but there would have been no such climbing aids when it was in use. On the southeastern and northeastern corners of the rear yard, there are grooves in the sandstone bricks, allegedly made by patients dragging their fingers along the bricks. Dates and initials have also been gouged into the sandstone, including a date from 1886 and one from 1971. Z Ward wasn’t closed until 1973. Some carvings that I particularly noticed were the hexafoil patterns in several of the bricks. Hexafoils have been used as a type of protective magic in many places, including Britain, Scandinavia and Australia. They are designed to ward off evil and protect people from witches and other dangers. The photo below on the left shows a rough hexafoil in a brick next to a window – like doors, windows are vulnerable entry points and need protection. The other photo shows a rudimentary hexafoil beside a date on the south-eastern corner. They could have been carved either as a protective aid or just to alleviate boredom. Or maybe both. Hexafoil in brick near a window. Hexafoil in brick at south-eastern corner. This entry was posted in Folk traditions, South Australia and tagged Glenside, Hexafoils, history, Parkside Lunatic Asylum, South Australian heritage, Witch marks, Z Ward. Bookmark the permalink. This is a very atmospheric place. My daughter bought me a night tour for my birthday! It was really interesting. And very stark.